So it's been a while since our last blog, so we thought we should write with some news! High season has now finished here on Samui although for us at The Dive Academy it has been really busy all year and all the staff have been working extremely hard certifying many new divers, expanding the experience of others and providing a great experience for our fun divers and snorkelers. 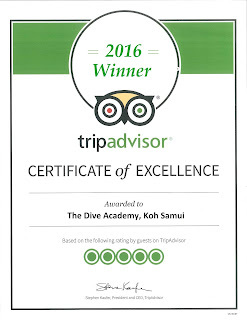 And with another Trip Advisor Certificate of Excellence Award for 2016, we are very happy! The weather and diving conditions particularly during September have been awesome, with 20-30m visibility at most dive sites. Sail Rock specifically has been stunning and we've had several Whale Shark sightings both there and at some Koh Tao dive sites, which has been great to see again. Even for some customers who were experiencing their very first breaths underwater they got to see such a very special animal! We also had a very rare sighting at Sail Rock and something never seen before in all our years here - a Sail Fish. Whether he/she was just passing through, we won't know but it was a great sight! We did have some issues with coral bleaching a couple of months ago at some of the shallower dive sites, due to the very high temperatures we were experiencing and lack of rain but fortunately this didn't last too long and the corals have now recovered which is great news. Sadly there is nothing we can do independently to stop this happening but making everyone aware of the small things they can do such as putting suncream on at least 45 minutes before entering the water, will all help. 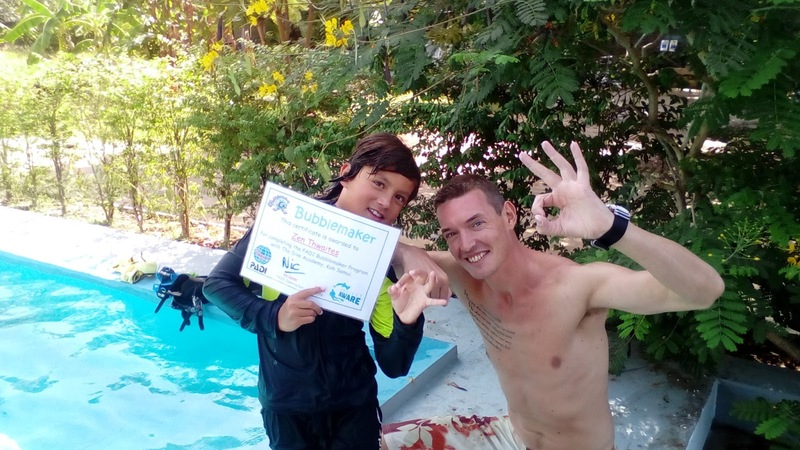 As the months of July and August are school holidays for those living in Europe, we have had many children doing Bubblemaker courses and also becoming PADI Seal's! 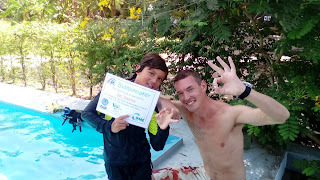 It's great to see so many kids so enthusiastic about learning to dive and becoming early ambassador's for nature and how to care for our underwater world. 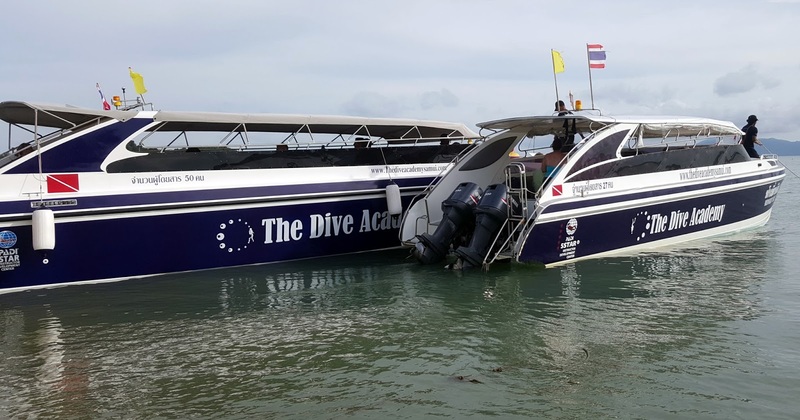 We also had a first in 11 years for The Dive Academy, which was teaching 2 young adults from the US to dive, who were both born profoundly deaf. After seeking medical clearance from our island Dive Medic, we proceeded with the classroom training. As you can imagine this took a lot longer than normal as we had to use a lot of writing (on both sides!) to ensure we could really explain the theory. Then we proceeded to the swimming pool for the confined training before taking them out on 2 dives to complete the PADI Scuba Diver course. With any impairment, it really tests our skills as Instructors to be able to adapt the course whilst still meeting performance requirements. Both students were successful and very happy to receive certification cards and Steve did a great job! 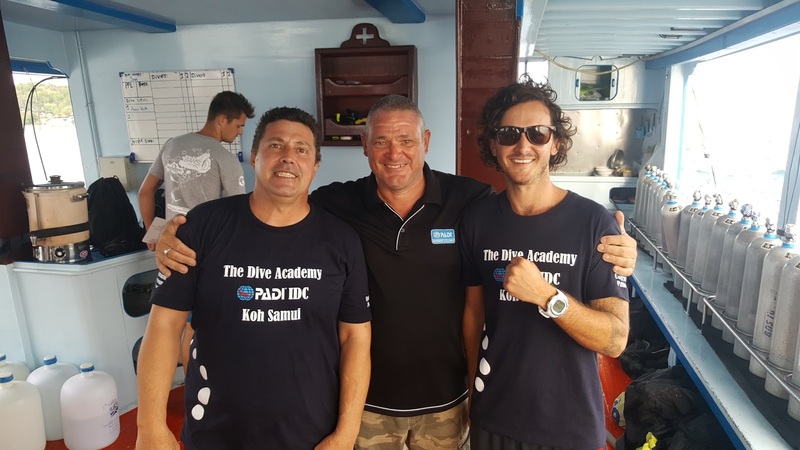 On the Pro front, our Course Director Paul had another successful IDC in July with 2 new Instructors hitting the PADI circuit. Tyler is going on to teach university kids in camps over in the US and Andreas decided to become an Instructor whilst he considers a life and career change over in Vietnam. Well done to both candidates who worked extremely hard to achieve their goals. 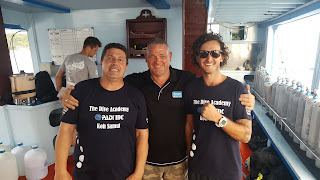 Now Marc who is a regular to Samui and to The Dive Academy, came back and started his Divemaster course at the beginning of September and only has a few more things to practise before he will be able to call himself a Pro. He is then joining on the next IDC, starting on the 25th October. Have a look at the great Pro packages on offer for IDC's and MSDT courses and think about what you could do to be part of such an exciting career and lifestyle. The last 3 months have also seen some new full time Instructors join the team. Have a look at our About Us page to see their ugly mugs! and decide whether you would like to have a French, Dutch, Italian, Spanish, German or Russian speaking Instructor! So, the best news this high season was the introduction of Midnight Blue II to our team. Just like our 2 engine speedboat, the new fibreglass 3 engine speedboat is purpose built for diving and provides a very comfortable journey when the sea is a little bumpy. 2 boats not only allows us the ability to cater for more customers but also to offer different destinations on the same day. As you would expect Midnight Blue II has the same colour scheme and the 2 boats stand proudly together in Bophut bay. Let's hope as we now enter low season for the next 2 months, the weather is kind to us! We'll be taking the opportunity to clean the boats up a little and also we have just drained our swimming pool ready to have the bottom tiled. 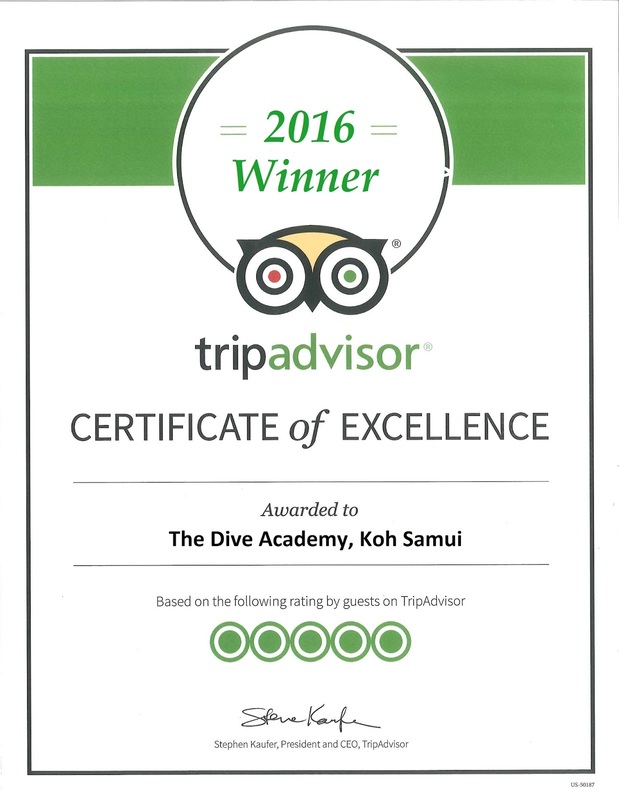 So come and check out our enhanced facilities which are truly the best on the island and have fun with The Dive Academy. 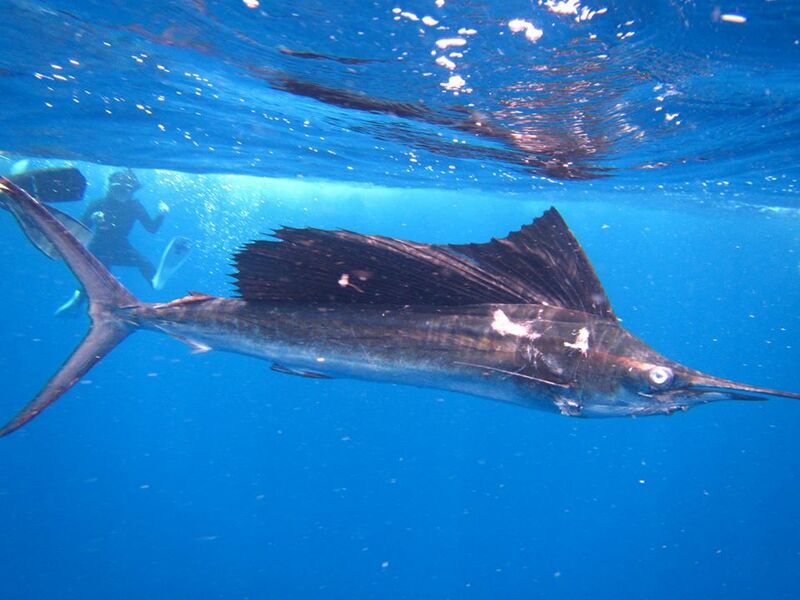 The next high season starting mid-December is only around the corner, so get your bookings in early to avoid disappointment and come and dive or snorkel with us and have some fun over Christmas and the New Year!